This is the newest version which features a 64-bit engine and supports multiple core processors. The Deep Fritz engine is supposedly almost 100 Elo points higher than the previous version. On the CCLR 40/40 rating list, the Deep Fritz 14 engine is only rated at number 20 though, placing it well behind the leaders Komodo 9, Stockfish 6 and Houdini 4. That does not matter though because there are a number of FREE engines, including Stockfish, that you can download. The main reason I like Fritz, besides the fact that's it's been my most used GUI and so I am familiar with it, is that it has a nice interface. A few players have complained that documentation is sparse and the interface is confusing, but I have not found that to be the case. Youtube has a lot of videos that cover all it's features and you can best learn how to use the various features just by playing around with it and experimenting. Of course, a variety of pieces and boards with different color formats are available and you can move the windows around and resize them to suit your taste. Forget the 3-D layouts though! Also, the new version runs faster and flows better on the latest versions of Windows. I am not much into the training and analysis functions, but they are excellent features. 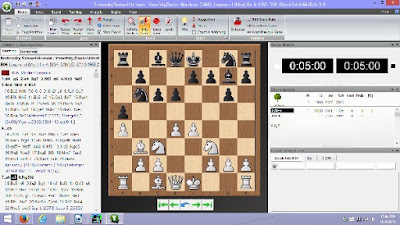 With a membership at Playchess.com server with Deep Fritz 14 you can, besides play real time online games, watch live commentary of tournaments or take part in training sessions with players like Daniel King, Klaus Bischoff, Maurice Ashley, Dr. Karsten Müller and many more. 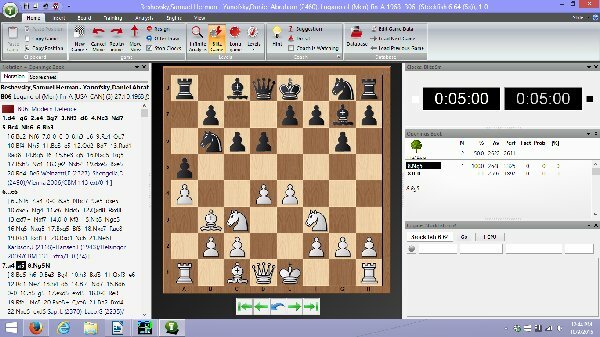 Deep Fritz 14 includes a free six-month Premium Membership to Playchess.com which is a nice perk that comes with your purchase. Deep Fritz 14 gives you access to “Let's Check” which is another feature I personally have no interest in, but it is popular. Over 200 million positions are available that have been deeply calculated by engines...handy for serious opening preparation or correspondence players I assume. This feature has little interest to me in correspondence chess simply because I prefer openings that while basically sound, are little explored. So, letting engines explore those positions for hours to uncover hidden resources is part of the fun of correspondence chess for me. In addition, Deep Fritz 14 comes with a new opening book with over four million positions and a database with over 1.5 million games. Some people have complained that the program is buggy, but I have not had any issues running it on Windows 8.1 on a quad core Satellite laptop. The truth is though that upgrading from my old Fritz 12 program didn't get me anything new except an upgraded opening book and database, but I don't consult the Fritz 12 book much and sometimes update my games database so it's not too out of date. If you already have a chess program that you like, I don't see any reason to get this one. However, IF you are looking for a good commercial program, Fritz is my preferred program. Just make sure you download a decent free engine because Fritz, while strong, isn't among the best. If you order from Chess Central they will also include Chess Masterpieces by Henry Bird. He wrote the book (available free on the internet) containing 150 games 125 years ago, but it's in old fashioned descriptive notation…”25.Kt takes R” so it is nice that the games are in electronic format. 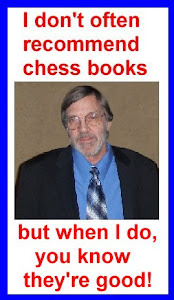 Chess Central normally sells the e-book for $10. This is just a nice little addition IF you are interested in playing over old games.